I was just over at VaperCompany checking out what’s new and came across the Youde UDT-V14. It doesn’t look like it’s on sale but I wanted to throw it out there because I haven’t seen it stocked at any other vendors. 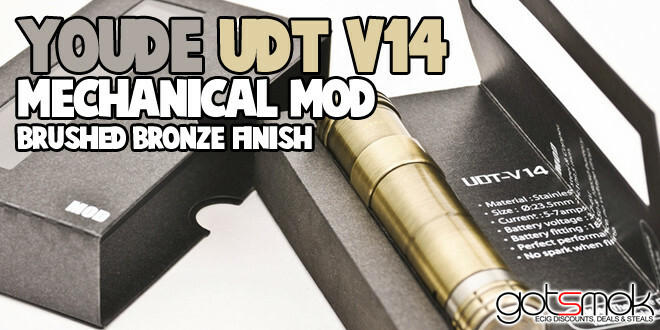 And, I gotta say… the brushed bronze finish on the Youde UDT-V14 looks kinda SEKSI! Besides, it looks like a pretty decent MOD featuring silver plated COPPER pins & a floating center pin. And… did I say that it has a brushed bronze finish? =) Keep in mind that all VaperCompany orders receive FREE SHIPPING too. Wow what a great mod to get without getting something counterfeit.